Slips of paper with numerals written on them. Make only one with #1 on it; make two with #2 on them; three with #3 on them; four with #4 written on them; five with #5 written on them. Mix up the slips of paper. Give each student a slip of paper. At the agreed upon signal, the students must find all the other students with the same number written on their paper. Repeat as often as desired. With a very small group, give out all the slips of paper. Instead of having the students group themselves, have them lay the slips of paper out in the correct order, #1-5. Items needed: A coloring sheet or poster with 1 baby, 2 buckets, etc., drawn on it. Show poster/coloring sheet to the class. Count each item (“1 baby”) and ask the name of the numeral in the mother tongue as well as the national language. Act out the situations on the poster. Someone plays “1 baby.” “2 buckets” are carried. “3 students” work in the garden, etc. Repeat the names of the numerals. Make mistakes (particularly in the mother tongue) and have the class members correct you. Variation 2: Have the class make the poster. They think up and draw #1, #2, #3, etc. Needed: room to move around; line on the floor or ground. A. Those who take too many steps must go back to the beginning. B. The person who is “it” might specify the type of step as well as the number of steps. For example: “1 giant step” or “3 baby steps” or “5 jumps” or “4 hops” or even “2 steps backwards.” Students who do not follow the directions must go back to the beginning. F4 How Many Did You Hear? The class is very quiet. 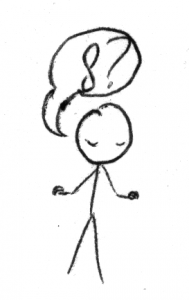 One person sits (or stands) in front with his/her eyes closed. The leader points to a class member; he quietly walks to stand behind the student whose eyes are closed. Once he’s there, the leader points to another person. This goes on until the desired number of people stands in the line. Then the one with his eyes closed may guess how many stand in the line behind him. Have the whole class count out loud. Did the one in front hear correctly? More challenging version: Write the numbers on the board or on different pieces of paper. Instead of saying how many classmates are behind him or her, the person with their eyes closed goes forward to pick the right number written on one of the existent cards. If he picks the right number, he receives a reward or a point. Can be played as a competition between two teams. Needed: 8 large pieces of paper with a different number of dots, 1-8, drawn on each one. As a class, carefully look at each piece of paper. Then lay them on the floor in different places in the classroom. The students all stand in one place, far away from the drawings. At the signal (a whistle), the children all run to the drawings. They stand in a row by each drawing. There needs to be as many people in each row as there are dots on the drawing. If there are already too many people by one drawing, the rest run to other drawings. Once the row for a particular drawing is complete, the ones in that row sit on the ground. Count the people around each drawing. Is it correct? Once the class has practiced the game, it can be played with two teams. Use two series of drawings and divide the class into two groups. Which group finishes first? Circles on the floor or ground (hula hoops or circles taped on the floor with masking tape). OR write the numbers with masking tape on the floor inside. Write a numeral on the board. Draw the correct number of dots after it. Discuss this with the class. Put the circles on the ground or floor. 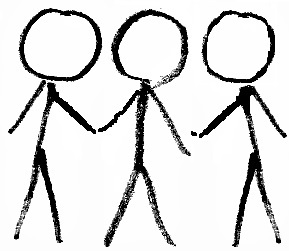 At the agreed-upon signal (such as a whistle), the class members stand on each paper or in the circles. The number in each group must be the same as the number written on the board. Check if this is correct. Praise the class members for correct groupings. Variation: If there are less than 15 people in the class, have them lay the correct number of markers (buttons, stones, bottle caps . . .) on each piece of paper instead of standing on the papers. Many cultures have a favored number. For example, in Western Europe “3” is favored. In traditional stories characters are granted 3 wishes, 3 brothers (not 4 or 5) try to woo the princess, 3 fairy godmothers give good gifts . . . People tend to list things in 3’s and even have 3 meals per day. In many Native American cultures, however, “4” is favored, after the 4 points of the compass. Things in legends and traditional stories occur in 4’s rather than 3’s. People are often not consciously aware of their favored number, but using it might make lessons more interesting or acceptable. Posters or chalk board with 1, 2, 3, 4, and 5 dots drawn on them; piece of paper for everyone in the class; something for them to draw with. Set the drawings of 1, 2, 3, 4, and 5 dots in front of the class. 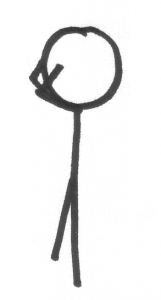 Ask class members to stand in front of the number they like the best. Count how many people are in each row. For fun, have each row do something different. Have everyone in the longest row jump in the air as high as they can, one time for each dot. Next have the shortest row do something like turn around and touch their noses. Let them be creative. One row can think up what the next row should do. Link the number of times they jump or turn around to the number of dots they have chosen. Make a note to yourself of the number with the longest row. Check later with other community members to see whether this number is important in their culture. Needed: Piece of paper for each person and something to write with. Activity: Have each person practice writing their favorite number. Together, find as many similarities between the shape of the numeral and things in their everyday life. For example, 1 looks like a stick; 8 like a pretzel they just ate . . . whatever they can imagine. Then have each person make a drawing next to the numeral of something that looks like or reminds them of the numeral. For example: 2 with a swan or goose or giraffe. They might also turn the number into a drawing (“9” is a girl with long curly hair . . .). 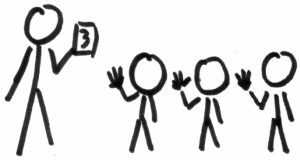 Needed: traditional storyteller or story from the local culture; papers or cards for each person with 1, 2, 3, 4, and 5 written on them. Additionally might also have sheet of paper for each person and something to write with. Traditional storyteller tells story in the students’ mother tongue. 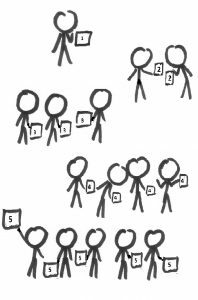 Each time a number is used in the story, the students hold up a card with that number on it. Note which number occurs most often. Have a student re-tell the story in the national language. The other students help count. How many brothers/sisters/birds/fishermen were there? How many times did the donkey take the wrong path? How many wishes did the peasant get? How many beans were in the bag? How many things did Jack take from the giant? If desired, have students draw features from the story with the corresponding numeral written on the paper. 7 swans. 4 bears. 3 clergymen (a rabbi, a priest, and a Baptist preacher were sitting in a boat . . .). Needed: space to run around. One person stands in front: Number 1. 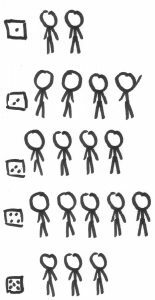 Note: It is possible to do the same game with another number–a “culturally significant number” or whichever one you want to focus on. Needed: a set of ten cards or papers with the numerals 1-10 written on them. Activity: Let everyone hold out their hands. We have two hands, with ten fingers. Can you lift one finger above the others? How about two? Show one of the cards with a number on it. Then ask everyone in the class to hold up the same number of fingers as the numeral on the card. Repeat until everyone knows how to recognize the numbers and numerals. Skills practiced: recognizing numerals, counting; finger coordination. Needed: little stones, nuts or beads, and a hard surface to drop them on, so that it makes a sound; black board and chalk. 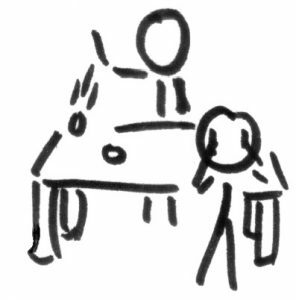 Have one person stand before the table with her/his eyes closed or with their back to the table. Drop a stone on the table so it makes a clear sound. Drop another one, and another one. Have the rest of the class count the stones as they drop. Afterwards, have the one in front feel the number of stones on the table to check whether or not she/he counted correctly. Then have her/him look at the table and count again. Write the numerals on a black board as the one in front says them, so the connection with reading and recognizing numerals begins. Skills practiced: counting; discerning differences in sounds; feeling; recognizing numerals. 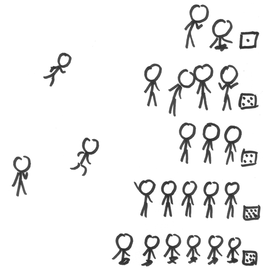 A pair of dice; a piece of paper and pencil for each student; a chart of what to draw. Students take turns throwing the dice. What the student rolls determines what part of the person they get to draw on their paper. The first student to finish the drawing “wins,” though all students are praised. At each roll of the dice, the class will say out loud what needs to be drawn. These are drawn in the order that the student rolls the number. 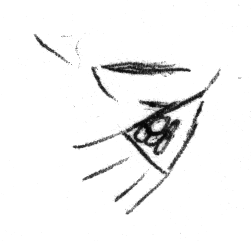 So, for instance, a student may roll 6 and draw hair before they roll 2 and draw the head. Twelve – an entire human (head with eyes, ears, hair, mouth; arms, hands, legs, feet). Make a rule for rolling the same number more than once. Either agree that if the same number is rolled, they draw that same thing again. The drawing might end up with six heads! This is okay. OR agree that if they get a number they have already had, they draw nothing and lose that turn. Variation 1: Instead of each student making a drawing, the entire class makes the drawing on the board or a large sheet of paper. Students take turns rolling the dice and drawing the part of the body indicated. Or the teacher can be the “artist,” making sure to make the drawing humorous rather than very artistic. Variation 2: Divide the class into two teams. Rather than each student doing a drawing, each team does a drawing. Students from each team take turns rolling the dice and doing the drawing for their team. Make sure each student has a turn by going clock-wise around the circle, for instance. Have the teams take turns as well (first one team, then the other team and so on). This will increase the fun. 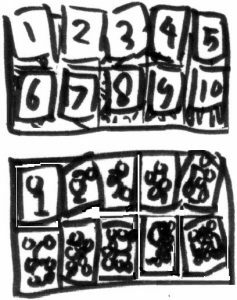 Variation 3: For each team, have a set of cards (slips of paper) with the numerals on them. After the dice are rolled, one student from each team must lift up the card with the correct numeral written on it. Even if it is not his or her team’s turn to draw, the team which is the first to lift the correct card may draw the part of the body part linked with that number. Variation 4: If dice are not available or, for some other reason, cannot be used, make two sets of 6 cards or slips of paper with 1, 2, 3, 4, 5, 6 dots on them and put them in a box or basket. Students take turns pulling out two slips of paper. Needed: 10 little stones (other small objects, like buttons, may be used instead as long as each one is different), black board and chalk. Have a student stand before you with his or her eyes closed. Put some stones in her or his right hand and some in the left hand. Let the student feel how many; have him or her count them. Have the student say the number. Write the numeral for this number on the black board. Have the student open his or her eyes and check to see whether he/she counted correctly. 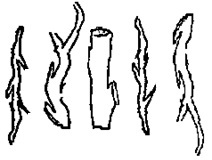 Then examine the stones thoroughly and describe one stone. (For example: one little sharp, white stone with a brown upper side; or one smooth, round, grey stone, or one stone found in the backyard of the pastor.) Teach the students to be precise in their descriptions. Then do the game again, with a different number of stones and a different student. 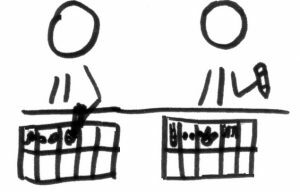 When the game is understood by all the students, let them play it in pairs of two. Stimulate the joy of getting it right. Skills practiced: feeling; counting; recognizing numerals; working together. Needed: Each person should have a large sheet of paper, divided into 10 spaces by folding or drawing lines; pen or pencil. Talk about something which an animal has just one of (a tail; a mouth; a nose). Have each student think of an animal. Have everyone say which animal they have chosen. Discuss the different shapes of tails (or mouths or . . .). Use words like hairy, soft, long, short, etc. Hand out the sheets of paper. Have each student draw the animal they thought of in the first space. 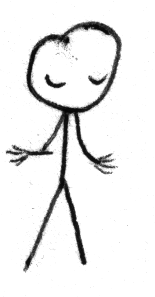 Make sure every drawing gets a lot of praise. Then think of an animal that has two of something, or think of something that an animal has two of (ears; eyes; wings; legs of a bird). Repeat discussion above. Have the students draw this animal in space number 2. As you go along, write the numerals 1, 2, etc. on the black board. Three (ears? Oh, no, what does an animal have 3 of? Nothing?) Draw a fantasy animal with three …. 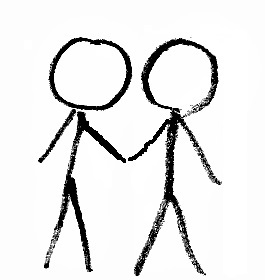 Show the drawings to each other, give compliments on creativity, have fun. Write each student’s name on their drawing or let them put a special mark on the paper to identify their own drawing. Skills practiced: vocabulary; describing textures and shapes; counting; drawing—fine motor skills. the papers from last lesson with 10 animals drawn on them. 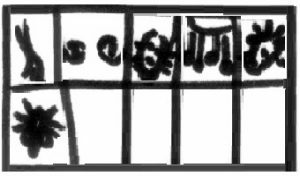 Have the participants place the right numeral on the right drawing of the animals. Give everyone a handful of markers (small stones or wads of paper). Let them put the same amount of markers under or on the drawing and numeral (one bean by #1; 2 beans by #2). During the process, walk around to give help and affirmation.